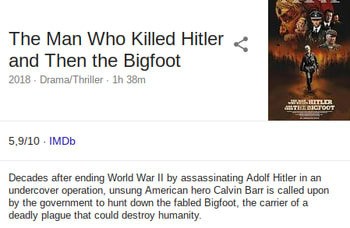 So it turns out that The Man Who Killed Hitler And Then The Bigfoot (in theaters February 8) isn't some John-Carpenter-inspired comedy adventure, but instead a surprisingly straightfaced action drama. Elliott plays a soldier who ended World War II by secretly assassinating Adolf Hitler for his crimes against humanity and mustaches. Forty years later, his old bones are pulled out of retirement for one last mission: to kill Bigfoot, who carries a terrible plague that could wipe out mankind and- hang on, we need to check something again. See, first-time writer-director Robert Krzykowski didn't just make a movie about killing monsters; he made a movie about killing monsters. Even the trailer plays with this, starting out with sweet guitar licks and Elliott going all Jack Reacher on a bunch of street thugs. 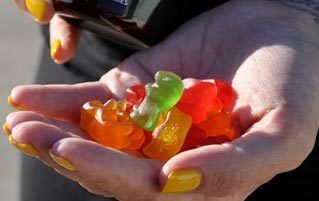 But then it gets to the pulp and, unnaturally, pumps the brakes instead of going full throttle. In fiction, monsters (be they human or otherwise) tend to only exist to be vanquished. That's how action works. First the hero vanquishes a bunch of biddy monsters, then they vanquish a very tough but not narratively relevant monster, then back to the biddy ones for a while until they vanquish the big bad monster right off a skyscraper. If it was good enough for John McClane back in the '80s, it's good enough for us now. But in TMWKHATTB, Elliott's character suffers from being a hero who kicks bad things in the teeth for good reasons, but then has to grow old still carrying the awful memories of those teeth-kickings. And if you can't get over killing a figurative monster who deserved it, what'll happen to you when you kill a literal monster whose only crimes are being sick and really bad at posing for photographs? While the jury is still out on the movie's quality, it's nice to see a comeback of old-school allegory, wherein an over-the-top mythos is used to drive home subtler themes about human nature. Of course, that doesn't mean The Man Who Killed Hitler And Then The Bigfoot won't also be a fun ride. After all, you'll still get to see Hitler get shot in the face again. And that always feels good ... as long as we don't have to be the ones pulling the trigger. For more, check out Ghostbusters 3 Was Announced Months Ago, But No One Noticed and YouTube Is Sick Of Dumb Pranks After The Bird Box Challenge.